205-324-7526 Lease Your Equipment Purchase today! Golden Tee 2017 is the latest version of the legendary pay-to-play video golf game. Avid video golfers around the world compete against the course, with friends or head-to-head in a wide variety of skill contest formats. Play for fun, play for glory or play for big cash prizes! Golden Tee 2017 offers players an unprecedented 60 spectacular 18-hole fantasy courses to choose from. A variety of game formats for casual, online and prize play keep players excited and engaged. Gorgeous hi-def game graphics, an amazing variety of customization options and the iconic trackball control make Golden Tee 2017 the undisputed leader in coin-operated video games. 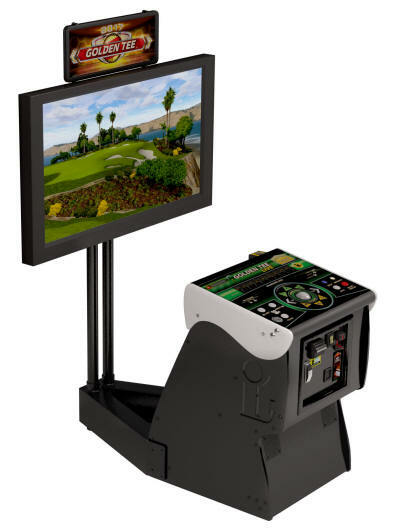 Golden Tee LIVE is available in the innovative, new Showpiece™ cabinet. The Showpiece cabinet represents the future of coin-operated entertainment cabinetry and offers an unparalleled level of flexibility and sophistication to the marketplace. HDTV Main Game Display - The Showpiece cabinet is compatible with a vast array of readily available, 720p (or better) hi-definition televisions with flexible options for connectivity. 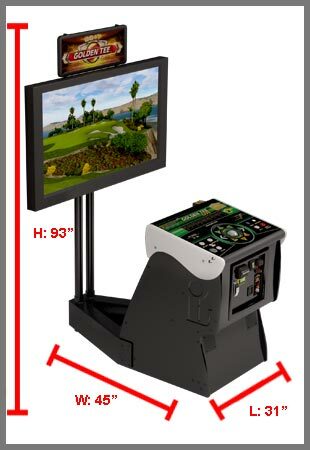 Optional Secondary Monitor - Golden Tee LIVE offers compatibility for a secondary monitor setup to display unique leaderboards and screens. The Showpiece cabinet is compatible with standard LCD computer monitors to accomplish this. Audio Connectivity Options - The Showpiece cabinet ships complete with an installed speaker solution but is flexible enough to give installers the option to enhance the audio experience utilizing HDTV speakers. New Integrated Stand from Incredible Technologies! The affordable Integrated Stand was designed especially for the IT Showpiece cabinet. The strong and sturdy metal stand is easy to assemble, and attaches securely to the Showpiece cabinet. The dual-post system can hold almost any 32"-50" HDTV. The end result is a complete, elegant and uniform game unit. The flexibility of the Showpiece cabinet lets operators tailor their monitor mounting needs to that of the location. Whether mounting on a stand or a wall, Incredible Technologies has a list of suggested solutions and installation procedures. Please note that IT cannot and will not be responsible for any potential or actual liability related to the use of third-party or modified IT cabinets, or monitor mounting systems.